Most RVs today will be equipped with a water heater to provide the convenience of hot water for cooking, cleaning and bathing. The two most commonly used suppliers of water heaters to the RV industry are Atwood and Suburban; however, there are CSA-approved tankless or instantaneous models available from Atwood and Girard that are being used by some RV manufacturers. The two most common brands mentioned above will consist of an insulated tank, which will be a clad aluminum lining with the Atwood and a porcelain-lined steel tank in the Suburban. They will usually be in a six-gallon or 10-gallon version. 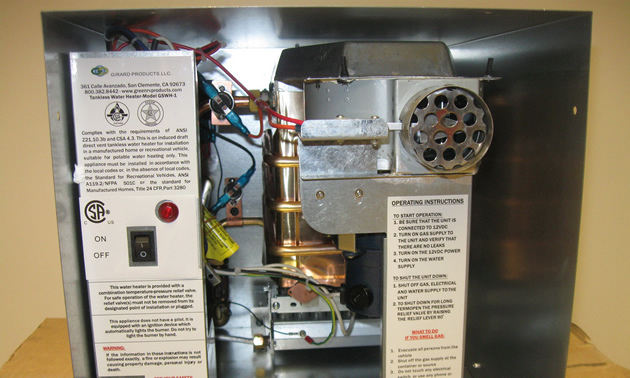 They consist of a flue assembly routed through the interior of the tank to transfer heat from the LPG burner to the water, a gas control valve that is either a manually-operated pilot model or a solenoid controlled by the DSI (direct spark ignition) circuit board, which also provides a spark to the electrode at the burner. They both will have specific or common safety features with each brand like limit switches, ECO (emergency cut out), pressure/temperature relief valves and thermal cutoff links. 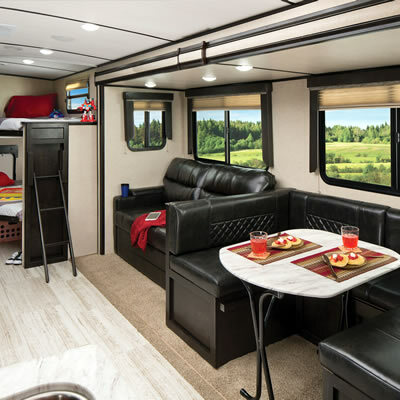 As well, both are available with the optional 110-volt, 1400-watt electric element to provide two heat sources, depending on the services available to your RV. Some motorhomes will have a heat exchanger option within the unit to keep the water hot while travelling. The RV water heater is rated by BTU (British thermal units) input and the rate of recovery, which is the number of gallons per hour the heater can raise the water temperature to 100 degrees Fahrenheit. Usually heating is slower on electric than propane, but the recovery time will be greatly improved if operated on both sources when shore power service is available at the start-up phase. During the RV season it is not uncommon to have customers come in with an issue with the pressure and temperature relief valve dripping or weeping. The valve will release or pop if the temperature exceeds 200 degrees Fahrenheit or water pressure exceeds 150 PSI. In some cases, if the water pressure is above 50 PSI or an air pocket is not formed at the top of the tank, the valve may weep and replacement is not always required. You can install a water regulator to the city water inlet or provide an air pocket to the top of the tank. To provide an air pocket or gap, first turn off the water heater and open a faucet until the water is cool. Turn off the water supply from the water pump or city hookup and open a tap closest to the water heater. Go outside and lift the lever on the pressure relief valve until water flow stops. Snap the valve shut, close the open faucet, turn on the water supply and restart the water heater. When the water heater cycles off slowly open each hot water faucet until the water flows smoothly. The Atwood water heater with the exothermal option will have a mixing valve installed at the hot water outlet. The water in the tank will be heated to above-average temperature and will mix with cold water, to provide about 50 per cent more hot water supply than the basic water heater. These valves can sometimes become almost inoperative due to the accumulation of debris and scale from calcium buildup. In any case, do not remove the mixing valve to change to the basic system without changing some very important components associated with this option. The water will be extremely hot, to a point where scalding will occur if you are not familiar with the exothermal function. Your local RV service center can diagnose and service the mixing valve. A good preventive maintenance procedure that can be done frequently during and at the end of the RV season is a tank cleaning or flushing to remove the accumulation of dirt and scale. You simply remove the drain plug or anode rod, open the pressure relief valve and turn on the city water to dislodge and flush the corrosive scale particles from the tank. You can also purchase a tank rinser or tank saver tool from your local RV parts store to provide a more efficient method. In the case of the Suburban water heater, there is an anode rod used to protect the tank liner in addition to being a drain plug. The anode rod will preserve the life of the water heater by itself corroding and providing cathodic protection from contaminants. When the anode rod reaches about 75 per cent loss of the material, it should be replaced. The tankless or instantaneous water heater is relatively new to the RV industry. Its extremely energy efficient and lightweight design provides hot water on demand. This type of system holds only about a pint of water when functioning, without needing recovery time or standby operation during use. The hot water is instant and unlimited. These units are based on the flow rate of the water and use microprocessors to control the heating of the water. The reduction of power consumption from the LPG tank heater model is about 60 per cent and it only weighs about 23 lbs. A winter use device is available on some models to allow operation during cooler outside temperatures. 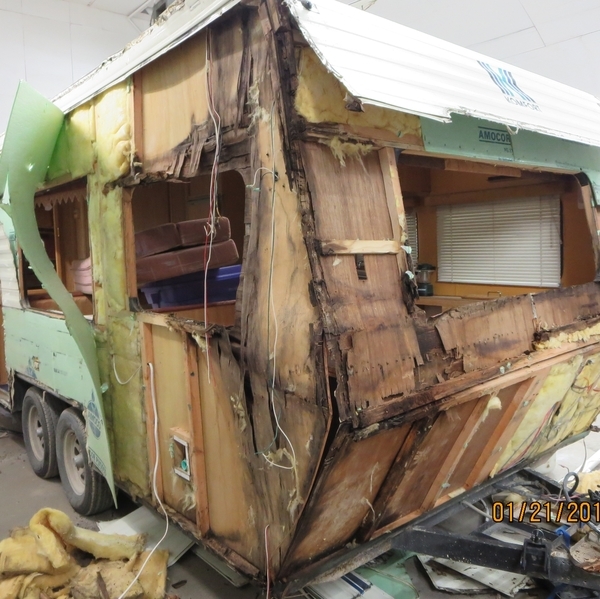 There are other preventative maintenance procedures involving the pilot and burner assemblies and I would advise you to make an appointment with an RV dealership to have a certified gas fitter service or repair your gas appliances.